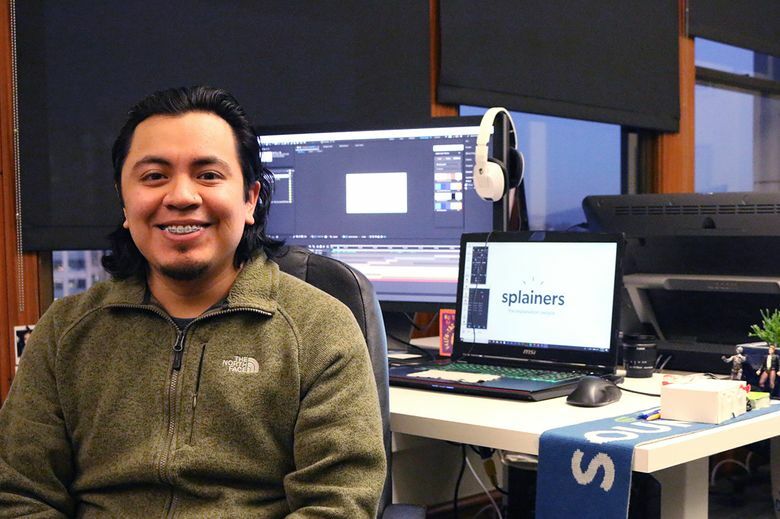 Meet Marco A. Piceno, a senior animator at Splainers in Seattle. What do you do? I help tell stories through short animated videos. After creating graphics and illustrations, I bring them to life using a software program called After Effects. So, I’m an artist, an animator and a storyteller. How did you get started in that field? After I studied animation at the Art Institute, Splainers gave me the opportunity to start working with them back in 2009. Originally, I was animating these amazing stories by making 3D environments for 2D, flat characters. It was all in one style. Now, our videos have evolved and I work in dozens of different styles. Every video and client is different. However, as our name implies, we’ve continued to dedicate ourselves to coming up with great explanations. What’s a typical day like? A typical day usually starts with a team meeting, where we learn about our client and discuss their needs. We then brainstorm ideas, write scripts, create storyboards and eventually animate the videos. On any given day we are working on many projects, so I might be sketching some art assets, recording a voiceover, doing style research, talking with a client, editing a video or animating a new production. For every video, there is a lot of iteration and massive amounts of information to process. A typical day also includes profound conversations with my colleagues, the sharing of links to interesting videos and a lot of music and laughter. What surprises people about what you do? People are often surprised to hear that I make a living doing animation and motion graphics. Not many people are familiar with these terms. Some people react by saying, “Wow, how cool!” But others don’t even seem to know that this is an actual profession. What’s the best part of the job? This is a hard question to answer. Not to brag, but seriously, this is a cool job that doesn’t feel like a job. It’s a very laid-back, creative environment — and that makes it the best part. But then again, the way our team has grown and bonded is also the best part. OK, so the absolute and ultimate best part of the job is delivering a final video to a client and hearing how much they love it!